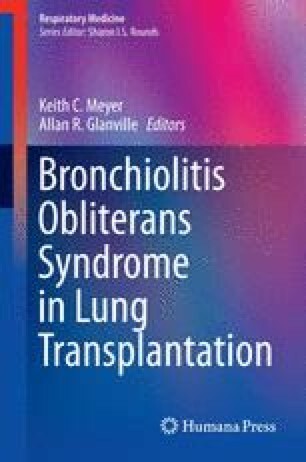 Why do apparently healthy, noninfected lungs fail after successful lung transplantation? Is there a unifying cause or do many insults and injuries lead to a stereotypic allograft response exacerbated by regional ischemia of the terminal bronchioles so that fibrogenesis dominates the histopathological result? These are basic questions that have troubled the lung transplant clinician since the first successful lung transplants were performed in the early 1980s. Perhaps we are closer to an understanding now, and the answer hinges, of course, on the concept of self and nonself and the recognition of the dichotomy that allows clonal expansion of B lymphocytes to mature into plasma cells that manufacture quantities of antibodies with allograft specificity [“the shock troops” of antibody-mediated rejection (AMR)]. The process is typically stealthy, however, and tends to remain clandestine until it is almost too late to undo or reverse the damage. If one does not seek, one will not find evidence that allograft damage is occurring due to AMR, and, as always, the tools that can be used to detect AMR are critical. We now have the tools, and the findings are quite overwhelming in their complexity. Therefore, some simplification is mandated. Hence, this chapter will attempt to clearly and succinctly explain how our understanding of the role and importance of antibodies to components of the pulmonary allograft has grown to the point where a seminal consensus can be reached about histopathological diagnosis that will help forge therapeutic endeavors with a novel uniformity of descriptive language, from whence adequate trials examining therapeutic efficacy will surely spring.